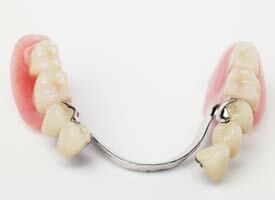 Partial dentures are created out of a metal and acrylic composition. A patient’s specific needs and anatomy dictate the design of the partial denture and every effort is made to construct a self-cleansing partial denture that preserves the remaining teeth and oral tissues. Our doctors will design your partial denture so that the chewing forces are evenly distributed over the entire surface area of the remaining teeth and soft tissues. Minor changes to your remaining teeth may be recommended to help equalize these forces.